This topic describes how the DCHU universal driver sample applies the DCHU design principles (Declarative, Componentized, Hardware Support Apps [HSA], and Universal API compliance). You can use it as a model for your own universal driver package. If you would like a local copy of the sample repo, clone from Windows-driver-samples. This sample is intended to be used with Windows 10 Version 1703 and later. Before you read this section, check out the requirements and best practices for universal driver packages described in Getting Started with Universal Windows drivers. The DCHU sample provides example scenarios where two hardware partners, Contoso (a system builder, or OEM) and Fabrikam (a device manufacturer, or IHV) are working together to create a Universal Windows Driver for a device in Contoso's upcoming system. The device in question is an OSR USB FX2 learning kit. In the past, Fabrikam would write a non-universal driver package that was customized to a specific Contoso product line, and then hand it to the OEM to handle servicing. This resulted in significant maintenance overhead, so Fabrikam decides to refactor the code and create a universal driver package instead. First, Fabrikam reviews the list of INF sections and directives that are invalid in universal driver packages. During this exercise, Fabrikam notices that they're using many of these sections and directives in their driver package. Their non-universal driver INF registers a co-installer that applies platform-dependent settings and files. This means that the driver package is larger than it should be, and it is harder to service the driver when a bug affects only a subset of the OEM systems that ship the driver. Also, most of the OEM-specific modifications are related to branding, so Fabrikam needs to update the driver package every time an OEM is added or when a minor issue affects a subset of OEM systems. Fabrikam removes the non-universal sections and directives and uses the InfVerif tool to verify that the new driver package's INF file is universal. Next, Fabrikam separates customizations that are specific to OEM partners (such as Contoso) from the base driver package into an extension INF. Note that extensions are always processed after the base INF in no definite order. If a base INF is updated to a newer version, then the extensions will still be re-applied after the new base INF is installed. Note that such a service could also be installed in a component or extension INF, depending on the scenario. Fabrikam has an executable file osrfx2_DCHU_componentsoftware.exe that they previously installed using a co-installer. This legacy software displays the registry keys set by the board and is required by the OEM. This is a GUI-based executable that only runs on Windows for desktop editions. To install it, Fabrikam creates a separate component driver package and adds it in their extension INF. The source code for the Win32 app is included in the DCHU sample. Note that the component driver package is only distributed on Desktop SKUs due to targeting set in the Windows Hardware Dev Center dashboard. For more info, see Publish a driver to Windows Update. Fabrikam would like to provide a GUI-based companion app as part of the universal driver package. Because Win32-based companion applications cannot be part of a universal driver package, they port their Win32 app to the Universal Windows Platform (UWP) and pair the app with the device. The new app (not included in the DCHU sample) is secure and can be updated easily in the Microsoft Store. With the UWP application ready, Contoso uses DISM - Deployment Image Servicing and Management to pre-load the application on Windows desktop edition images. ; In-Process ATL COM Server MSFT Sample. This directive can also be used to coordinate installation of INF files in multifunction devices. For more details, see Copying INF files. While a base driver can payload an extension (and target the base driver in the shipping label), an extension bundled with another driver cannot be published to the extension hardware ID. In some scenarios, a driver package may contain a file that is intended to be loaded by a binary in another driver package or by a user mode component. A user mode DLL provides an interface for communicating with a driver in the driver package. An extension driver package contains a configuration file that is loaded by the driver in the base driver package. In these situations, the driver package should set some state indicating the path of the file or a device interface exposed by the device. For example, the driver package could use an HKR AddReg to set this state. For this example, it should be assumed that for ExampleFile.dll, the driver package has a SourceDisksFiles entry with no subdir. This results in the file being at the root of the driver package directory, and the DestinationDirs for a CopyFiles directive specifies dirid 13. The above examples use an empty flags value, which results in a REG_SZ registry value. This results in the %13% being turned into a fully qualified user mode file path. In many cases, it is preferable to have the path be relative to an environment variable. If a flags value of 0x20000 is used, the registry value is of type REG_EXPAND_SZ and the %13% converts to a path with appropriate environment variables to abstract the location of the path. When retrieving this registry value, call ExpandEnvironmentStrings to resolve the environment variables in the path. If the value needs to be read by a kernel mode component, the value should be a REG_SZ value. When the kernel mode component reads that value, it should prepend \? ?\ before passing it to APIs such as ZwOpenFile. To access this setting when it is part of the device's state, first the application must find the identity of the device. User mode code can use CM_Get_Device_ID_List_Size and CM_Get_Device_ID_List to get a list of devices, filtered as necessary. That list of devices might contain multiple devices, so search for the appropriate device before reading state from the device. For example, call CM_Get_DevNode_Property to retrieve properties on the device when looking for a device matching specific criteria. Once the correct device is found, call CM_Open_DevNode_Key to get a handle to the registry location where the device state was stored. Kernel mode code should retrieve a PDO (physical device object) and call IoOpenDeviceRegistryKey. To access this setting when it is device interface state, User mode code can call CM_Get_Device_Interface_List_Size and CM_Get_Device_Interface_List. Additionally CM_Register_Notification can be used to be notified of arrivals and removals of device interfaces so the code gets notified when the interface is enabled and then can retrieve the state. There may be multiple device interfaces in the device interface class used in the above APIs. Examine those interfaces to determine which is the correct interface for the setting to read. Once the correct device interface is found, call CM_Open_Device_Interface_Key. Kernel mode code can retrieve a symbolic link name for the device interface from which to get state. To do so, call IoRegisterPlugPlayNotification to register for device interface notifications on the appropriate device interface class. Alternatively, call IoGetDeviceInterfaces to get a list of current device interfaces on the system. There may be multiple device interfaces in the device interface class used in the above APIs. Examine those interfaces to determine which is the correct interface that should have the setting to be read. Once the appropriate symbolic link name is found, call IoOpenDeviceInterfaceRegistryKey to retrieve a handle to the registry location where the device interface state was stored. Use the CM_GETIDLIST_FILTER_PRESENT flag with CM_Get_Device_ID_List_Size and CM_Get_Device_ID_List or the CM_GET_DEVICE_INTERFACE_LIST_PRESENT flag with CM_Get_Device_Interface_List_Size and CM_Get_Device_Interface_List. This ensures that hardware is present and ready for communication. 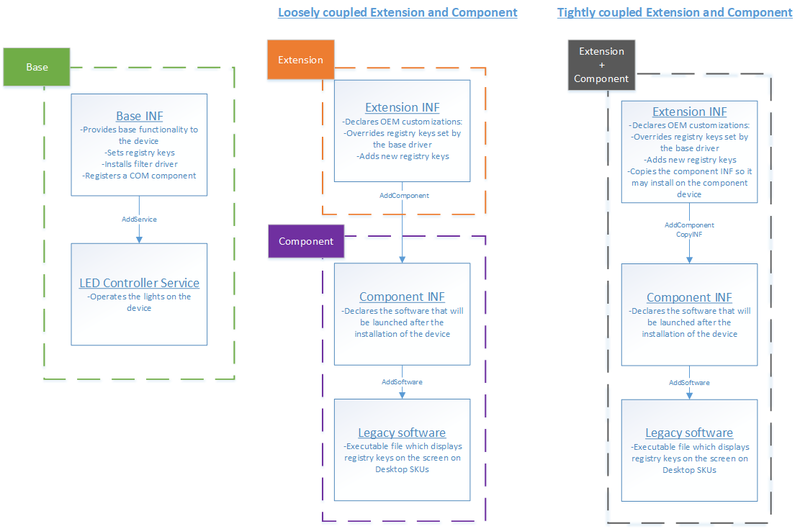 The following diagram shows the driver packages that Fabrikam and Contoso created for their Universal Windows Driver. In the loosely coupled example, they will make three separate submissions on the Windows Hardware Dev Center dashboard: one for the base, one for the extension, and one for the component. In the tightly coupled example, they will make two submissions: base and extension/component. Note that the component INF will match on the component hardware ID, whereas the base and extensions will match on the board's hardware ID.